This is due partly to the poverty that’s so commonplace in many parts of the country, but also because it’s prepared in such a way that just about any native Brazilian you talk to loves eating this very simple yet wholly nutritious dish, no matter what pay scale they’re in, and this Brazilian food is served often, even overshadowing any meat that might be served alongside. If you think that eating rice and beans all the time is boring, or you’re not crazy about the idea of it being associated with not having a lot of money, then perhaps the following knowledge will help you see things in a different light. It’s very nutritious. If you are at all into eating healthy, but have to be on a tight budget, Brazilian-style beans and rice can help you make sure you’re getting good amounts of vitamins and minerals, as the combination not only offers up the complete range of 20 amino acids, but you get plenty of protein, iron, magnesium, etc. Granted, white rice is considered high on the glycemic index, so, if you need to, you could use long-grain brown rice, but ideally, you’ll be getting in plenty of workouts to burn the calories that come from using white rice. Beans and rice doesn’t have to be a bland dish. Brazilian beans and rice are cooked up with onions, garlic, a bit of salt, olive oil, bay leaves and even a bit of cumin or hot pepper, if you like a bit of extra heat. Some people choose to cook beans with bacon, some don’t. It’s completely up to you. 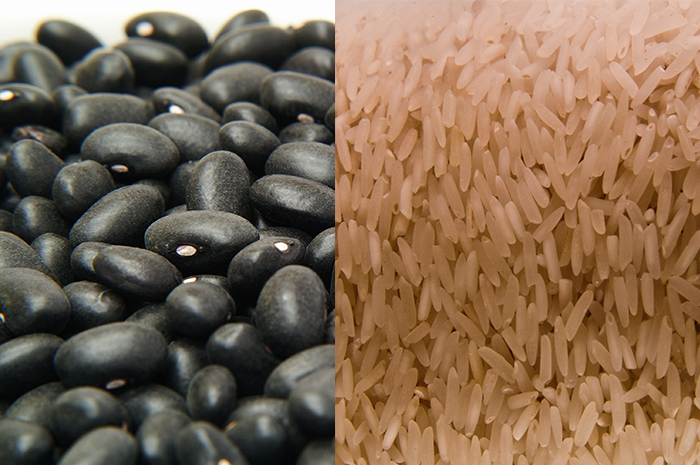 You can use either pinto beans or black beans, though black beans is actually the more common ingredient. If you’ve cooked beans and rice, even beans from a can, and you’ve stomached it without a lot of seasoning, you’re completely missing out on beans and rice cooked from scratch, Brazilian style. Once you try the Brazilian way of cooking this amazingly simple and budget-friendly dish, you’re going to be quite pleased with the results. So pleased, in fact, that you’ll want to have it more often, especially if you use the bay leaves, serve it with a bit of sauteed garlic on top, and with a salad. This healthy combo is truly yummy! You might think, however, that this is overdoing it on the garlic, since the rice is already cooked with onion and garlic. But considering that garlic, like onion, has vitamin C and other immune boosters, you might actually find yourself feeling healthier over time, not catching as many colds or other viruses. The beans and rice will also boost any strength-training and cardio efforts because it’s such a complete meal, nutrient-wise. Now, traditionally, the beans are often cooked on the stove top, either in a pressure cooker or in a stock pot, but if you’re often short on time, dinner-prep-wise, canned beans can be used. But there is nothing like Brazilian beans and rice cooked completely from scratch. Budget-friendly, delicious and nutritious, Brazilian beans and rice—especially cooked with the onions, garlic and other spices—is a healthy meal to be savoured and enjoyed.